If your garage door is stuck open and your property is exposed or your garage door is stuck closed and your car is stuck in your garage, that’s an emergency. Just call us at the number above and we’ll be on the way to solve your problem. You’ll be happy to know that there’s no additional charge for after hours garage door emergency repairs. 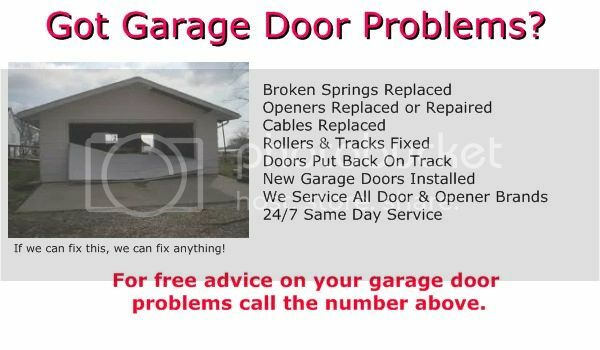 Are you having garage door problems? Depending on the nature or your problem you can possibly fix it youself. Here’s some tips on the problems you can master yourself. Does your garage door sometimes go up and down by itself? Scary isn’t it? The likely cause is that your garage door opener is on the same frequency with the same access code as that of someone else in your neighborhood. It may possibly be also caused by radios in police cars or aircraft flying overhead. One way to keep this from happening is to simply change the access code in your remote control. There are as many ways of changing the the code as there are manufacturers of garage door openers. One possibility is to open the case of the remote and move some switches around inside. While this is a start, then you have to also change the frequency your opener is looking for. This may be done on a panel on the opener itself. Some openers may change their code simply by holding the remote close to the opener motor, then holding a designated button down for 30 seconds or longer. The last solution would be to get a new garage door opener along with a new remote. This step is a little drastic to cure an unexplained random opening or closing of your door, but the fact is that if this is happening to you, your garage door opener is very old. It’s been some time since openers were plagued with this problem. What if your door goes halfway down, then back up again? This is caused by the safety sensor that will activate if there is an obstruction blocking the path of your door. The obvious cure is to check for possible obstructions to your door’s movement. It may be a broom, a bucket or any other item that you store in your garage. If you can’t find an obstruction then you may have dirty sensors. Dirt will block your sensors from completing the circuit that allows your door to work. Cleaning the sensors or removing any spider webs or possibly condensation will probably rectify your problem. Finally, if your garage door works but not with the remote, it’s probably time to change the batteries.